FORE! Take care of your clubs after every use with the two-sided brushes. 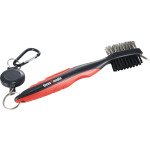 Metal bristles and nylon bristles that easily aid in ridding dirt and grass from your irons, different brushes to accommodate all club and gear materials. Built-in stainless steel groove cleaner has a protective cap that makes it easy to store. Retractable carabiner is an added bonus for quick access and ease of carry. 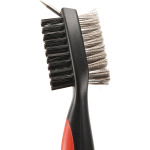 Product size: 7.75" H x 1.5" D.
I'm interested in learning about the Golf Utility Brush. Please contact me.